If you can overlook the time it takes to get your final print, the Nobel 1.0 is a more than capable high quality 3D printer at a great price. XYZprinting produces FDM 3D printers that are perfect for education such as the Da Vinci 1.0. These printers feature enclosed environments, cartridge filament systems and no nonsense straightforward software that makes them incredibly easy to use and an ideal choice for demonstrating the technology to students. At present FDM (fused deposition modeling) printers are by far the most popular consumer choice, and with good reason – they're easy to use and don't create a great deal of mess, whereas SLA (stereolithography) printers take time to maintain between prints and can get messy. So despite producing high quality prints the SLA process has, until now, really only been available to the pro market. There's a huge difference between the two technologies, SLA and FDM, so it makes sense for a company with a firm footing in the education sector to produce printers that demonstrate each tech. The FDM process as used by the Da Vinci is simple to understand: a filament is melted, the printer follows a plan and the model is built layer on layer as the filament cools and hardens. When it comes to SLA printing the process is actually quite similar despite the raw material and the print being made upside-down. 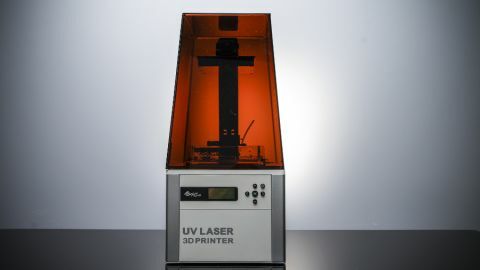 The hotend and nozzle that extrudes the filament in an FDM printer is replaced by a laser, this again follows a pattern to build a model layer by layer, but rather than a solid starting material such as PLA or ABS filament, a liquid resin is used. As the laser hits that resin, which is UV sensitive, it hardens and creates the 3D model. Unlike an FDM printer this all has to happen behind a protective screen to prevent harm to the user by the laser. Once the printer has finished the model making it's then over to you as the print requires washing and time to harden under UV light, so both SLA printing and finishing is time consuming and messy. However the results even at the lowest print settings are of a high quality. This is the reason that most SLA printers reside in professional printing environments rather than the home. Just a short time ago the majority of 3D printers looked like self-build kits, with the likes of the original Ultimaker, but XYZ have always produced printers that look complete and professional. The Nobel – which retails at £1,290 (around $2,000, or AU$2,800) – really wouldn't look out of place in a university science lab, with its large white base and removable UV shield. The design is well thought out and its simple appearance looks great, and this simplicity is reflected in an easy setup process, as well as general use. The unit is surprisingly heavy for its relatively small size weighing in at 9.6kg, with a height of just 59cm tall and a small overall footprint of 28cm x 33.7cm, enabling it to easily be positioned neatly on a work surface. At the back is the power socket, on switch and USB port – the latter can be used for either direct connection to a computer, either Mac or PC, or a USB key with the print-ready 3D models. On the front is the control panel and this gives you quick access to the setup and configuration options as well as direct print from USB. Protecting the print area is a large plastic UV shield which once removed reveals the resin tank, bottle and print platform. The configuration of the print area shows the stark difference between SLA and FDM printing, with the print base suspended from the column rather than planted on the floor of the printer, and there is no sign of a hot head or rails. This build area is a respectable 12.8 x 12.8 x 20cm, a similar sort of area as seen with the FDM printers like the Luzbot Mini which boasts measurements of 15.2 x 15.2 x 15.8cm. This print area, unlike an FDM effort, is suspended upside-down and is held at the top of the print column by a large bolt. When printing commences this base is plunged into a pool of liquid resin and a UV light source (laser) is fired from inside the Nobel to set the resin and create the 3D model. The Nobel is of a high quality and if looked after correctly should provide a good length of service. Unlike an FDM printer that uses hard filament that is melted, the Nobel uses a liquid resin that is contained within a tank at the base of the printer. The setup process takes a good 30 minutes with tubes requiring connection, and time is needed for the printer itself to initialise.